When schools formulate their educational philosophy, typically they look for a model that most closely fits what they believe is true about students, the nature of learning and the teaching/learning process. Silverdale Baptist Academy has found the philosophy of British educator Charlotte Mason (1842-1923) to be the most effective model of what we believe is best for children. Mason herself was a humble visionary, orphaned at the age of sixteen, and though passionate about her beliefs, was never one to consider herself as a founder of a perfect educational system. In fact, her emphasis was on the child as a person, indeed a mystery, and not a product to be manufactured in schools. Her view of schooling was authentic and inclusive, envisioning a generous and broad curriculum for all children, regardless of class, race, or privilege. To accomplish this, she wrote over 3000 pages of educational ideas, established schools and a college, and extended her curriculum to schools and homeschoolers worldwide. The four pillars of her educational methods are: Education is an Atmosphere, a Discipline, a Life, and the Science of Relations. “Atmosphere” refers to a child’s learning environment, which she believed began in the home and should imitate its best aspects where possible. Less teacher talk, narration, student ideas, and intrinsic motivation are just a few of the components of that atmosphere. “Discipline” involves establishing habits, which both serve other people and act as deterrents to behavior that can inhibit learning. Thirdly, children should be fed living thoughts and ideas, not just dry facts. This is the “Life” of education. By providing students a feast of “living books,” alive with passion and good storytelling, students naturally become active learners. Finally, our learning is established through the “Relations” and connections we make between subjects, people, and things. Included in this area is the relationship our students form with God, history, nature, master artists, great composers, and the men and women of renown. 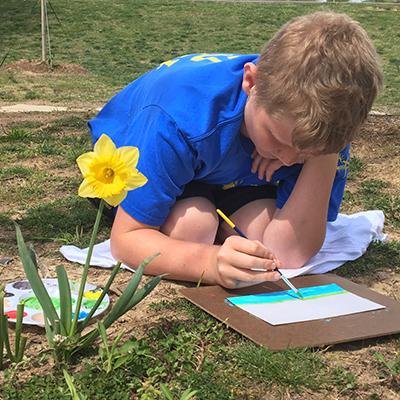 Like Mason’s students, our children spend much time in free play outdoors, doing significant work with their hands, acting out drama through their imagination, and gaining mastery of cultural pursuits, which today includes technology, mathematics, sports, and the media. The methods of Charlotte Mason waned after her death in 1923; however, we are proud to be a part of the resurgence in the US. Silverdale Baptist Academy is a member of the ChildLight Association with schools in the Southeast which incorporporate her methodology in their daily academic life.